For other uses, see Berzelius (disambiguation). Architect Donn Barber's Berzelius Society, 1908 or 1910. Detail of entryway ornamentation. Berzelius Society symbol depicted within shield. The alumni trust organization, the Colony Foundation , owns the society's building. 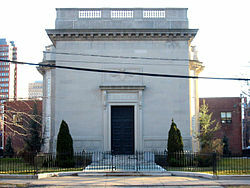 Outsiders refer to the building as a 'tomb', the customary appellation for a secret society structure at Yale; however, many BZ members refer to their building as "The Hall." This is likely a transferred linguistic remnant of the tradition of the 'Sheff' secret societies, which had 'halls' for residential use and 'tombs' as separate meeting places, in contrast to the Yale College senior secret societies, which maintained only "tombs." Architectural historian Patrick L. Pinnell notes in his 1999 book "Yale University" Princeton Architectural Press ISBN 1-56898-167-8 .) that Berzelius sold to the Scroll and Key Society the site on which the latter erected its own tomb. The society takes its intellectual mission very seriously, invoking Socrates' exhortation "The unexamined life is not worth living” as well as stating to its prospective members that: "Berzelius provides opportunities for achieving insights through an open, honest exchange of experiences, passions, and opinions. This process prepares its members — whose diversity is highly valued — for an active, intellectually vigorous, and moral life, giving them a place and time for contemplation and reflection so that they might rise boldly to the challenges of their lives, devoted to good character, tolerant of others, and willing to serve their communities, while forging links of mind to mind in a chain unbroken."